Carrying your wallet and your smartphone is essential before you leave the house. However, at times, carrying both of them together can be cumbersome, especially if you have a heavy wallet (or a phone). But to remedy this, phone case manufacturers came up with the idea of wallet cases that can double as a wallet as well as a protective cover for your smartphone. This is particularly the case with Samsung smartphones as the company makes some of these accessories on its own. 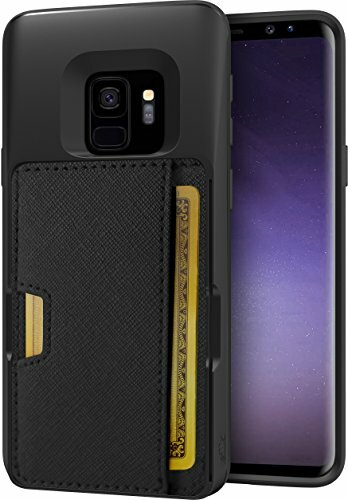 We’re going to talk about some of the third party wallet cases for the Galaxy S9 available in the market today. Obviously, we’re also going to talk about Samsung’s very own LED View Wallet case as well, which was released along with the smartphone itself. So what other options do we have on the list? Let’s find out. Coming up as our number one choice, we’re looking at the MaxBoost Galaxy S9 Wallet Case. The MaxBoost isn’t all about protection, but instead provides you with a nice, stylish and leather wallet case. The flip cover is actually quite protective, keeping the screen safe from scratches and scuffs. This one actually contains three card slots, as well as a side pocket for money, receipts, or additional cards, such as your ID. It actually has a magnetic lock design, so it automatically wakes and sleeps your phone, too. There’s a convenient to use kickstand feature for watching media comfortably as well. 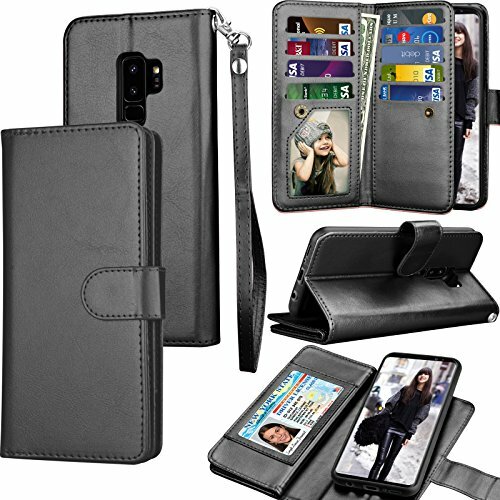 In second position on our countdown, we’re looking at the Galaxy S9 Wallet Case by Vena. Vena is a premier brand in phone accessories, and actually does an excellent cross between top protection and a way to store your wallet items. It actually provides military grade protection, so you’re quite safe in the event of an accidental drop, even if you dump water all over your phone! Shockproofing ensures your Galaxy S9 stays intact from hard falls and drops on the ground as well. It actually has a hidden compartment where you can keep your credit cards, debit cards, and even some cash. You could very easily fit identification like a diver’s license or State ID inside as well. This is a pretty slick wallet case as the product description will have you know. It comes with three card holders and a slot to hold cash, if you so please. 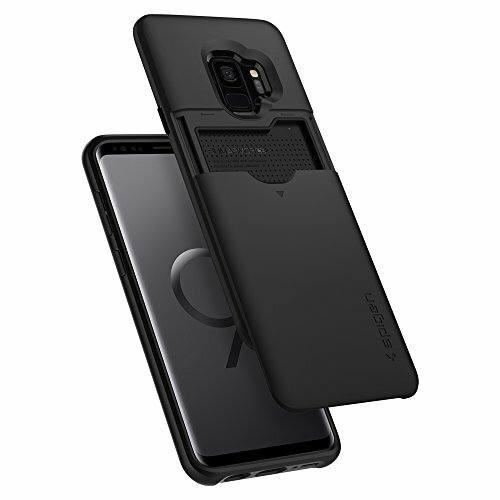 It also comes with a kickstand, so you can prop up your Galaxy S9 to watch movies or other media content at your will. The company talks about the case having a superior grip on the sides, allowing it to be held more comfortably and ultimately make it less prone to accidental drops or spills. Using the case, you can also lay your phone flat on the surface, making it a truly rugged offering. Further, the corners of the case are well protected to make it resistant to drops of any kind. The company calls this the “Wallet Slayer Vol 2”, which might be the best name for a product like this. The case is only available in Black Onyx, however, so color options are fairly limited. This wallet case for the Galaxy S9 will cost you $24.99 on Amazon. Considering the kind of features and protection it offers, we don’t think this is too steep a price tag. Coming from VRS Design, this slim wallet case is designed to give you a wallet case without adding any of a wallet case’s bulk along with it. The edges are well rounded and finished to make sure it’s comfortable in your pockets. As is the case with any modern day case, it has ergonomically placed bumpers to make sure it doesn’t slip on any surface. This also helps it lay flat on any surface without harming the display. The wallet case is made of TPU, which in turn means it can absorb shock from accidental drops without harming your phone at all. 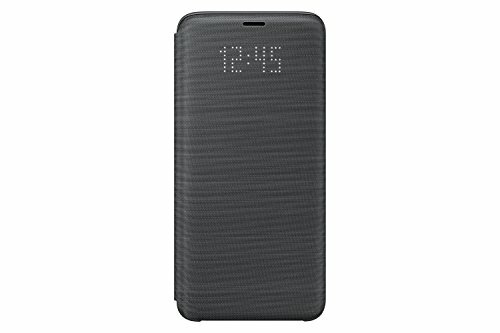 Since it comes with a dual layer design, it looks like a pretty ordinary case from the outside. Sliding out the back portion of the case reveals the card holder, which is a clever design choice to be honest. This attractive wallet case can be yours for just $16.99. Amazon is currently offering the case in Lilac Purple, so there is a real dearth of color options at the moment. This is more of a conventional wallet case as you can tell by its appearance. Don’t go by its old school appearance, however, as it can hold plenty of cards comfortably. It might not be ideal for cash, however, although there’s provision for that too. One important thing to mention here is that even though the case appears bulky, the company has made sure to etch out all the slots in the right areas to give you unhindered access to all the essential buttons on the phone. It’s also incredibly helpful that you can detach the wallet part of the case if you find it too cumbersome, turning it into a standard flip cover like accessory. Not many covers offer this, so kudos to Tekcoo for thinking of this. Given the foldable nature of the cover, you can also use it as a kickstand to watch movies or media on your Galaxy S9. For the kind of features it offers, we would definitely recommend this case. At only $12.89, it’s pretty cost effective too. Samsung’s own LED View wallet case is a worthy contender among all other third party accessories. But the downside here is that this is slightly more expensive compared to third party offerings. However, what you’re getting is unparalleled compatibility and features that you cannot find on any other case. 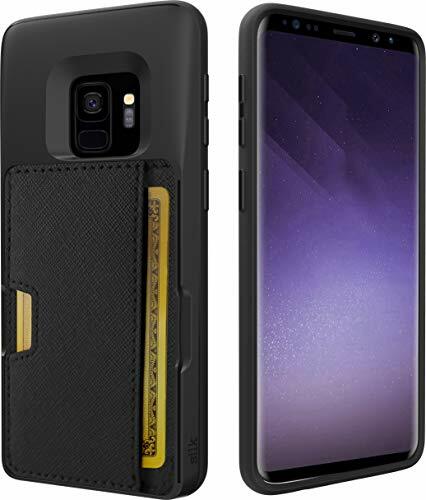 Since Samsung designs and produces this case, it is tailored to work exclusively with the Galaxy S9. There are some exclusive features, like the display being visible through the case, which makes for an exciting user experience. Naturally, it also comes with a card holder, making it a wallet replacement (kind of). While it doesn’t accommodate as many cards as some other cases, it’s certainly one of the best cases available for the Samsung flagship. The LED View case is available in Black, White, and Blue, with an estimated price tag of $38.98. Spigen is no stranger to making cases, and that’s the case with one of the hottest Android phones of the year. 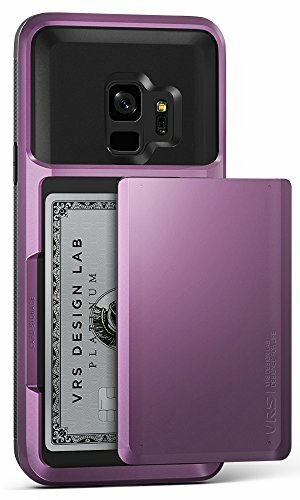 The Slim Armor case for the Galaxy S9 comes with a rugged exterior, and of course the ability to store your cards (up to 2) and some cash as well. The fact that it can securely hold your ID, cards and cash is what makes it a pretty worthy candidate on our list. Since this is a Spigen product, you can expect nothing but the best in terms of quality and durability of the case. It’s made using high quality TPU, ensuring that your device stays safe as long as you use the cover. You can have this case for as low as $14.99 on Amazon. The product is available in Gunmetal, Rose Gold, and Black color variants, so there’s something for everyone here. For those unaware, the case also comes with 2 years of warranty, which is quite amazing.